Welcome fellow Ocean Explorers. Thanks for joining me on Research Expedition 340 to the Lesser Antilles. Your virtual research cruise sails from March 6, 2012 through April 17, 2012. The adventure will take place aboard the international ocean drilling ship, the JOIDES Resolution. The purpose for this blog is to provide an authentic ‘Life at Sea’ experience for 40 days and 40 nights, so ask questions about living on a ship, food, recreation, etc. I invite you to follow along by visiting this blog, posting comments and questions, and touring the JR website, especially Expedition 340. So prepare your sea legs and off we go beginning March 6! Each week test your best ocean sleuthing skills, as I ask the question “Where on the JR is Rocky the Bull?” Rocky will be a VIP aboard and will tour a different part of the vessel each week. You are invited to guess where Rocky is and determine what activities take place in the location Rocky is either videoed or photographed. During the 40 days sailing aboard the JR it is our goal to retrieve 9 cores from the ocean floor (refer to the map to the right) in order to document the history and dynamics of three volcanic centers of the Lesser Antilles island arc. From these cores scientists will attempt to represent the full range of observed volcanic behavior. Read more as I blog the day to day activities aboard, both the science and life at sea. Remember to post your questions and comments. 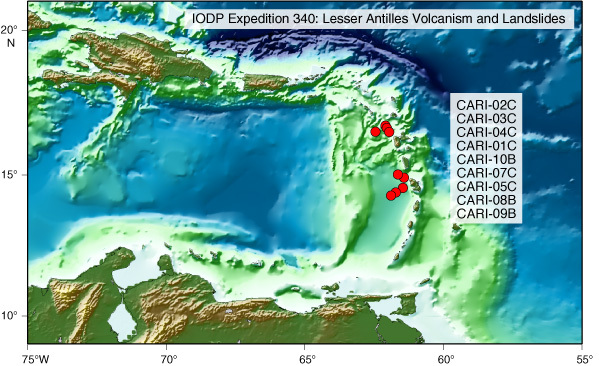 Join the Expedition 340 scientists as we decipher volcanic processes along the island arc of the Lesser Antilles (also known as the Caribbees). The islands of the Lesser Antilles form the eastern boundary of the Caribbean Sea and Atlantic Ocean. The Caribbean islands are regions of intense seismic activity, including frequent earthquakes, occasional tsunamis and volcanic eruptions. The more we know about what controls volcanic processes the better we can understand their dynamics and the potential geohazards created by them. Most of our understanding of these island volcanoes is from studies on land, which provides only part of the geologic record. But now during Expedition 340 we will explore the rest of the geologic story by recovering cores and marine deposits of volcanic debris from the ocean floor. By retrieving ocean-based cores that cover more than a million years of magmatic activity and sampling directly through volcanic avalanche deposits, additional pieces of the geology puzzle will be discovered. Then by combining the land and ocean-based geologic records a more complete volcanic story can be composed about island arc volcanism. In addition to the Adventures at Sea blog, my students from the two Honors classes I am teaching will be joining me aboard the JR via video conferences in late March and early April. This is not the typical science class! Students will be blogging and tweeting during the 40 days and responding to weekly science challenge questions as well as tours of the JR vessel. The class mascots are a penguin, named Dr. FlaJelly, and a narwhale, named Unicorn of the Sea. Print article This entry was posted by greely on March 2, 2012 at 4:38 pm, and is filed under Oceanic Updates. Follow any responses to this post through RSS 2.0. You can leave a response or trackback from your own site.